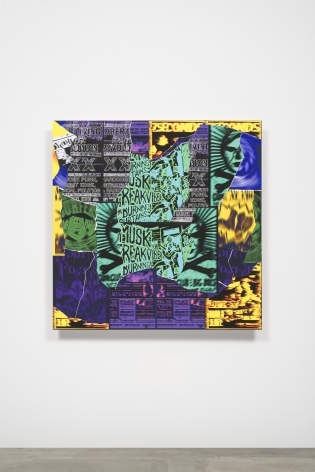 Anthony Meier Fine Arts is pleased to announce an exhibition of new work by artist Gary Simmons. 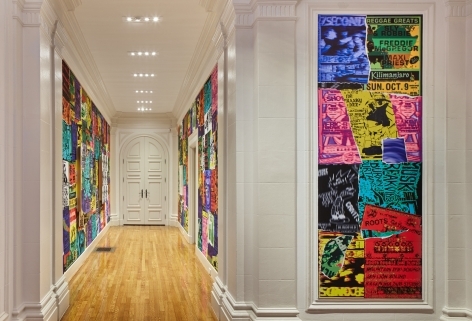 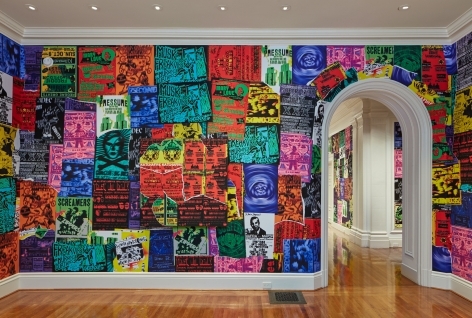 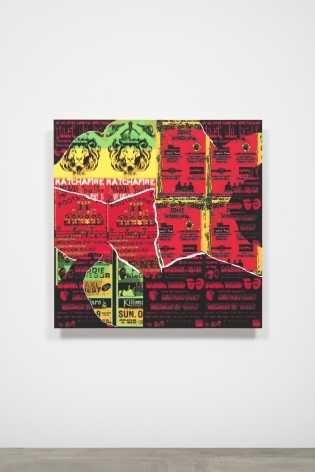 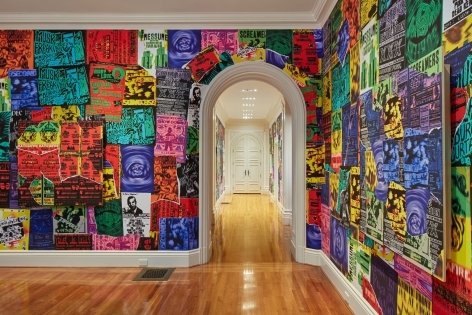 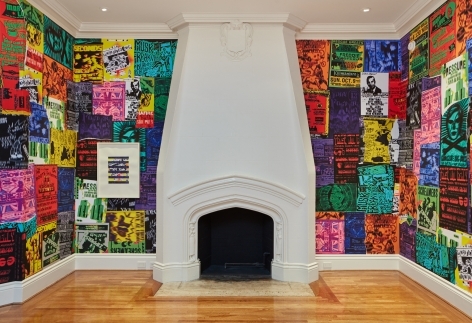 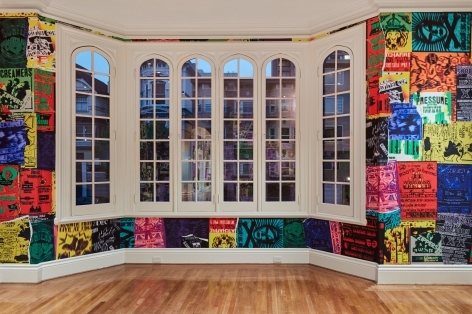 In his fourth show at AMFA, Simmons immerses the gallery in an environmental installation, wallpapering the entire space in layers of self-created musical fly posters. 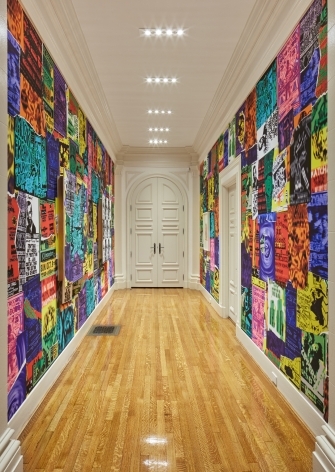 Individual panels of the same material are placed on top of the wallpaper, creating a tangible tromp l’oeil. 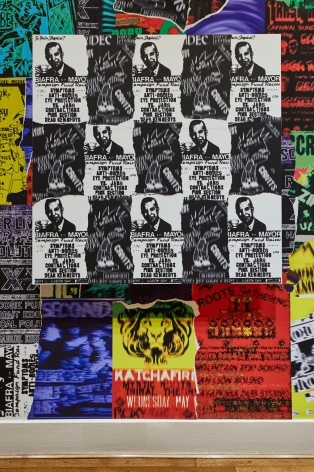 Musical fly posters – the guerilla marketing technique of (legally or illegally) adhering posters advertising shows and events with wheat paste to construction site barricades, building facades and in alleyways - were a visual diary of a place and its people. 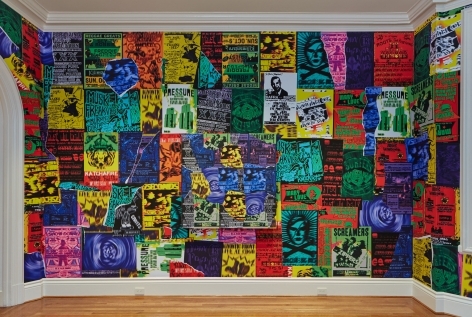 Engaging contemporary media to source base imagery for his posters, Simmons then crops, re-orients, re-colors, re-prints and re-engages the original content. 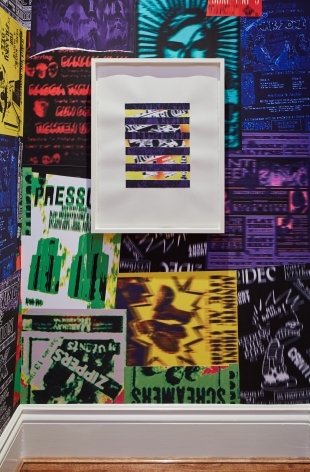 Collage layering the redefined posters, Simmons continues to morph them manually, tearing and turning the paper, to shift the viewer translation one more time. 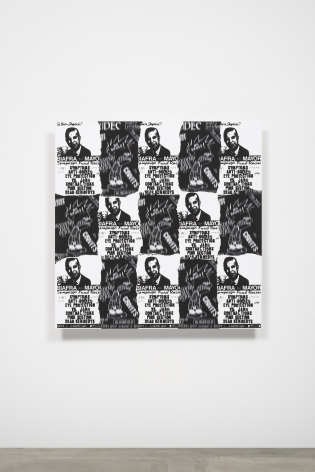 Robust, colorful and visually frenetic, Simmons quiet commentary on the manipulation of culture by digital content creates a shadow of dialogue that stretches long; touching politics, economics, personal freedoms and identity. 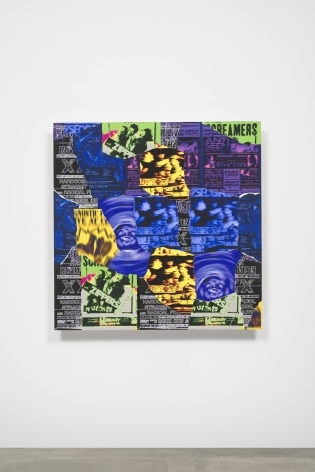 Simmons creates works that create palpable memory – the smell, feel, touch and taste of time framed by a particular cultural calendar. 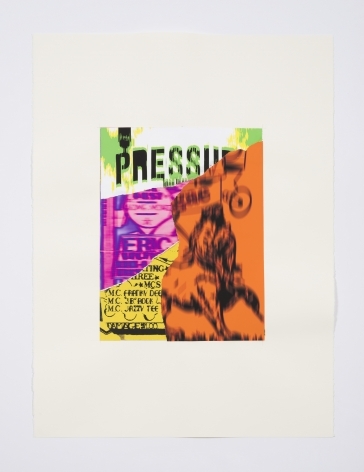 The viewer functions as the reflection of the now, a different interpretation for every set of eyes. 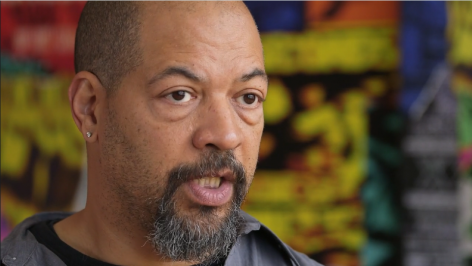 Gary Simmons was recently featured in the 56th International Art Exhibition All the World’s Futures curated by Okwui Enwezor and organized by the Venice Biennale. 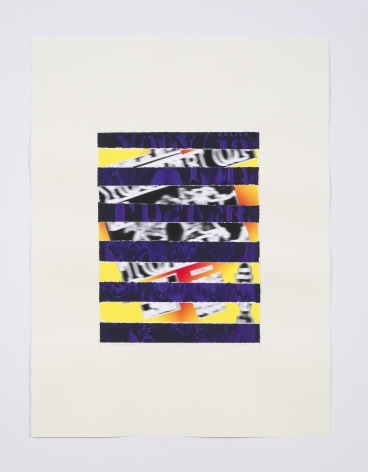 He was also included in the Sharjah Biennale 12 in the United Arab Emirates and Prospect New Orleans 3. 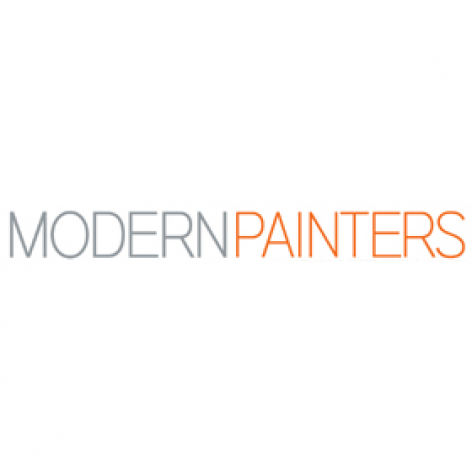 Selected public collections include the Albright Knox Art Gallery, Buffalo, NY; Baltimore Museum of Art, Baltimore, MD; Hirshhorn Museum and Sculpture Garden, Washington, D.C.; The Miami Art Museum, Miami, FL; Museum of Contemporary Art, Chicago, IL; The Museum of Contemporary Art, Los Angeles, CA; The Museum of Modern Art, New York, NY; Philadelphia Museum of Art, Philadelphia, PA; The Saint Louis Art Museum, St. Louis, MO; San Francisco Museum of Modern Art, San Francisco, CA; Studio Museum Harlem, New York, NY; Walker Art Center, Minneapolis, MN; and the Whitney Museum of American Art, New York, NY.